I think I've mentioned to all of you before on this blog that I could never be a vegetarian. I still maintain that sentiment. I just love meat and seafood too much and would find sticking to vegetarian cuisine full time as too limiting. Well, one of my goals for 2013 is to take my healthy eating to an even higher level. So I decided that me and my family will be partaking in "Meatless Mondays". I'm sure most of you have heard the term. If you google it, you'll find that in recent years it has become all the rage. We all know that a vegetarian diet is a very healthy way of life and eliminates the chances for certain health risks like heart disease, cancers, etc. Well, most people don't realize that not eating meat even just one day a week also gives you a lot of the same benefits. So I plan to regularly share with you all some of our "Meatless Mondays" meals. Don't you worry, I will still post my regular meat-filled dishes as well. The "Meatless Mondays" dishes will just provide some variety. 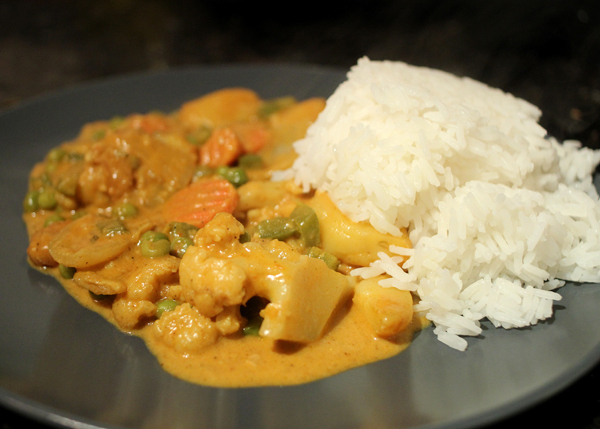 Last Monday, I decided to make a vegetarian Indian Korma. Even though I'm no vegetarian, I have eaten plenty of vegetarian dishes at Indian restaurants. They have so much variety. I found this recipe on Pinterest and decided to give it a try. I did make a few tweaks. 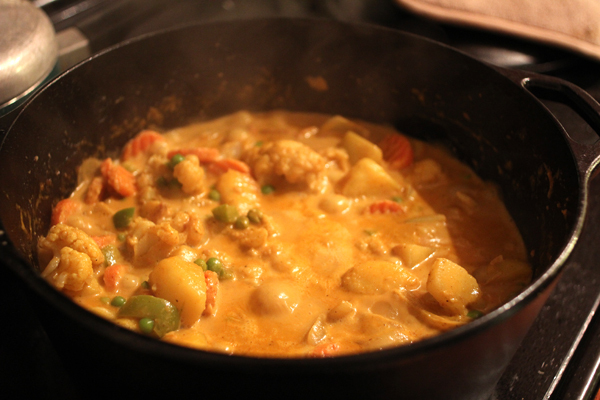 Instead of just using all regular yellow curry, I used half regular yellow curry and half guaram masala. I also added a teaspoon of coriander and cumin. 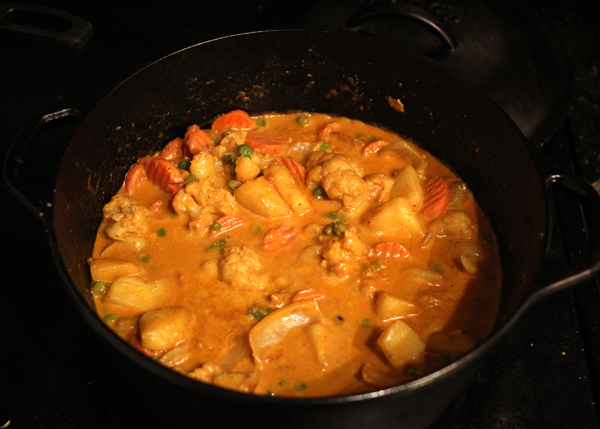 As you can see from the pics, I also added cauliflower to make it even more hearty. I served it up with jasmine rice and naan bread (not shown). It was pretty tasty! Of course, Tuesday we ate it again for leftovers, but I threw some chicken in it. Baby steps. haha The recipe can be found HERE. That looks delish! Thanks for the recipe! I don't call it Meatless Mondays but I also do the same thing where we go without meat for several meals per week. It was something my mom did so I've just copied. This looks deelish. I'm a practicing vegetarian/pescatarian so I'm loving this. Thank you! It looks really good. Do the babies eat it? I find curry a bit strong but my Indian neighbor's kids eat it up so I was just wondering how your kids like? Faith--that's a great habit you got going. Miss Foodie Fash--Glad you enjoy! More recipes to come! That looks so good. I feel like I can smell it through the screen. It doesn't help that I'm hungry though. I can't wait to try this. I am trying to start some steady traditions like this in my household and this is a great way for me to get it started! We used to have Taco Tuesdays and Fish Fridays...lol So I guess Meatless Mondays will be up next!